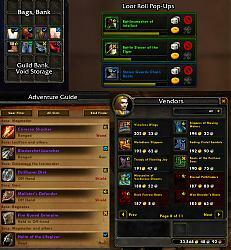 World of Warcraft AddOns » Stand-Alone Addons » ToolTip » Can I Mog It? 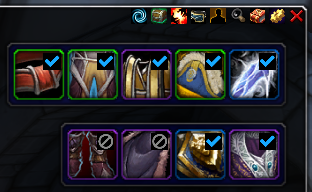 Overlays and tooltips about your progress for a transmog sets. 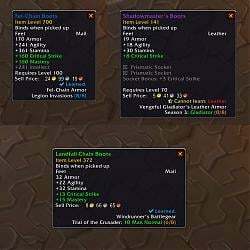 Auctioneer Cheapo searcher module - Module for Auctioneer that allows searching for cheap missing transmogs in the Auction House. TokenSplainer - Displays what item a gear token will turn into. Pairs well with TransmogTokens. TransmogCleanup - Helps sell items you have learned. #202 Fixed error due to removal of WorldMapTooltip. Added Bagnon support (thanks to LudiusMaximus). #163 Fixed memory issue with Battle Pets. Fixed issue with icons being left behind. #187 Changed containers to hook UpgradeIcon event. Added the overlay to the quests frame! #25 Added the overlay to the quests frames. #192 Prevent error when sourceID is nil for learning appearances. #193 Added database debug print command, /cimi dbprint. #194 Add value of tooltip text result to debug tooltip. Workaround for GETITEMINFO_RECEIVED bug from 8.0 added by Resike. #86 &; #190 Fixed ArkInventory overlay and ArkInventory offline character mode. #187 Fixed overlay not always updating after certain actions. 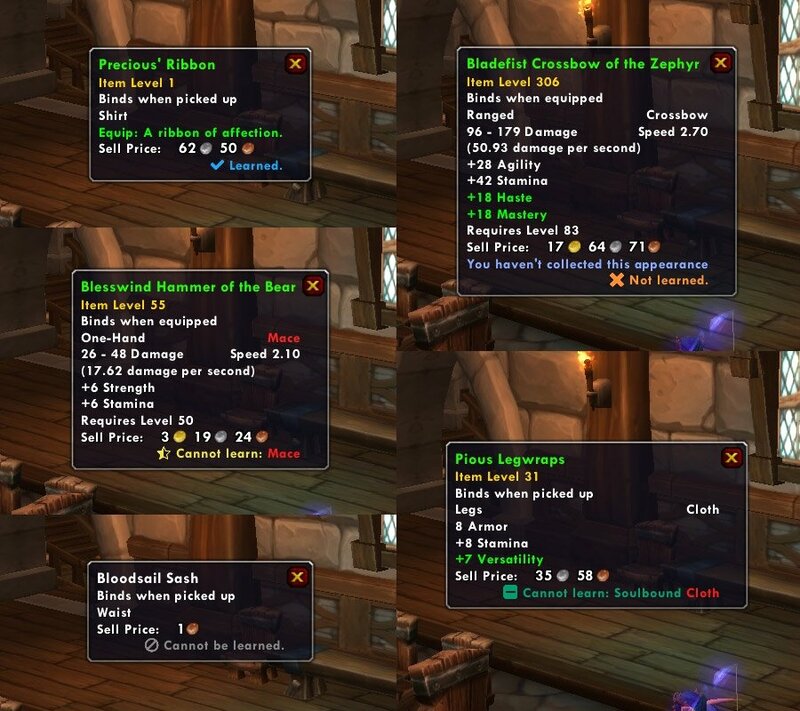 #191 Added 3 BfA pre-patch world quest items to exception list (monk shoulders, monk gloves, hunter shoulders). Patch 8.0 and LiteBag support. #38 LiteBag support added by LiteBag author Xodiv. Items with Class Restrictions are now properly considered for if you know the appearance or not based on the class you are on. Added "/cimi count" which reports the total number of known appearances across all characters. #185 Fixed issue with class restrictions not being taken into account. #168 &; #176 Fixes for database storage of Class Restriction information. #182 Fixes PairByKeys error when jumping from a very old version of the addon to a new version. #172 Fixes the tooltip not showing up after multiple chat link clicks. #169 Avoid lag when looting by only recalculating the looted item, not all items. #174 &; #175 Hopefully prevents memory leak by removing DressUpModel redraw. #151 Hopefully fixes the DressUpModel giving bad source IDs. #167 Add trial/boost versions of invisible Salvage Yard items to exception list. Added Black Market Auction House overlay! #152 Added overlay to Black Market Auction House. #153 Hopefully prevented errors when the cache is reset mid-calculations. Bug fix: Fix nil cache errors and compounding lag. #144 &; #145 Changed order of cache.lua and code.lua in TOC to prevent missing cache issue. #146 Fix compounding lag caused from getting source ID from DressUpModel frame. #150 Changed the debug tooltip to not reset the cache. Bug fix: Overlay and tooltip should now always update after learning an item. If it does not please let us know! #133 Changed how caching is stored, from itemLink to sourceID to hopefully properly remove items from the cache. Bug fix: Set appearance list now properly updates. 142 Fixed set list ratio text not updating when learning appearance. #105 Deadeye Monocle marked as Cannot be learned. #133 Slight delay added to tooltip/icon update to try to prevent it missing the event and not updating at all. #138 Set count now updates when learning/unlearning an item. #139 Hopefully fixed the bad sourceID issue which was causing Cannot Learn messages on unexpected items. #132 Tooltip and overlay added to Mythic Keystones. Added tooltips to crafting reagents in crafting windows. Rework of tooltip generation to be more consistent across the game. Bug fix: Resolved the lag when learning or unlearning an appearance. #120 Learning an appearance now only clears that item from the cache. The cache is no longer reset every time an item is learned. Bug fixes including preventing an error caused by Bagnon. Tweaks to Auctioneer exception and Soulbound overlay display. #62 Fixed Exception items not showing the overlay. #63 Changed some exception items to show Cannot be learned instead of Learned because while they're invisible and share AppearanceID with the Hidden items, technically they cannot be learned themselves. Added a few more exception items. #103 Fixed old work-around with Tabard assignment. #129 Improved Auctioneer check to only disable the overlay when CompactUI is enabled. #130 Bind on Pickup items that cannot be learned by your current character will now show the green negative icon everywhere (vendors, looting, etc.). 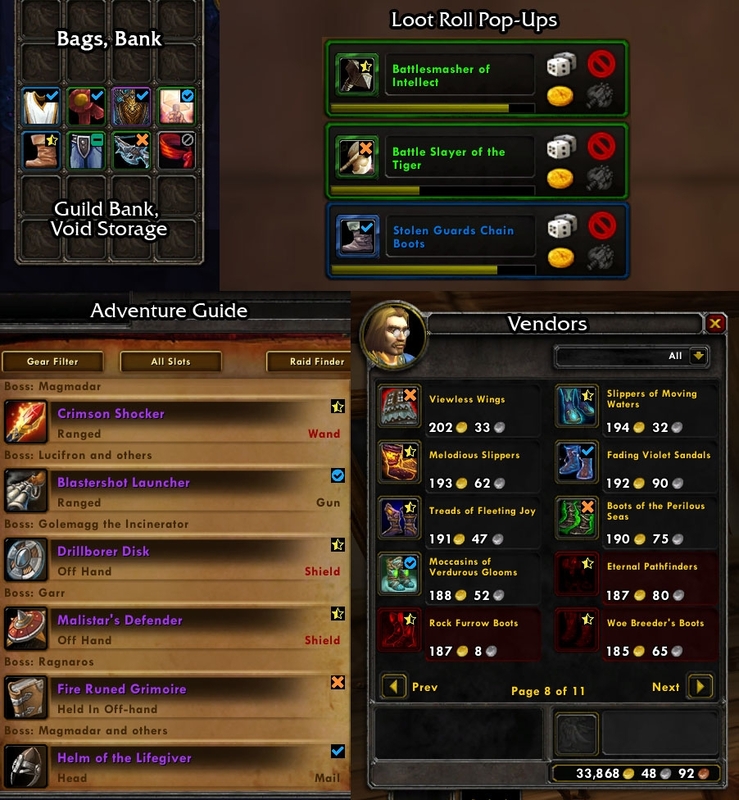 #131 Fixed bug when Blizzard's guild bank frames aren't loaded due to an addon (Bagnon). Prevent Auctioneer from loading icons. #127 Prevent the icon overlays from showing up in the Auction House when Auctioneer is enabled (it is not yet supported). #119 Overlay now uses Blizzard constants in more places, which means addons like Extended Vendor UI will work more often (although they may still have issues). 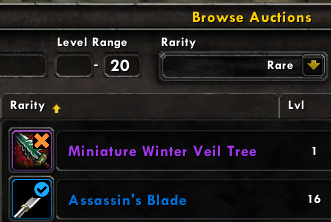 #116 &; #117 Auction House overlay now updates when options are changed and is included in the Show Bag Icons option. #95 Tooltips and bags overlay will now properly display Cannot Learn: Soulbound instead of Cannot Learn: Reason if you moused over an item before looting. #98 Encounter Journal overlay will update if you have it open and then loot and learn an item. 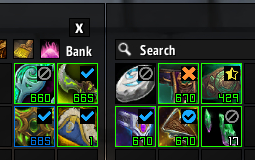 ElvUI bags and bank now have the overlay! #18 Added some more slash commands. #44 Added support for ElvUI bags and bank. Also Tradeskills windows now update correctly. #106 Updated options menu checkbox sound to use 7.3 API. #112 Cleaned up Locales in TOC. Prevents errors with addons that overwrite the default Auction House. Auction House now has the overlay! #24 Added the overlay to the default Auction House (code from crappyusername). #97 Separated the overlay code into different files and their own subfolder. Release of database change. You cannot downgrade from this version to older versions! If you do you will have to delete your CanIMogIt.lua save variables file! Changed how the database stores items so that items of different types that share appearances are not stored together. #40 Added ArkInventory support (with code from @Urtgard). New feature: Progress numbers added to the Appearance Sets list! #79 Bugfix with Timewalking items and source type. #71 Added small ratio for variants in Sets window. 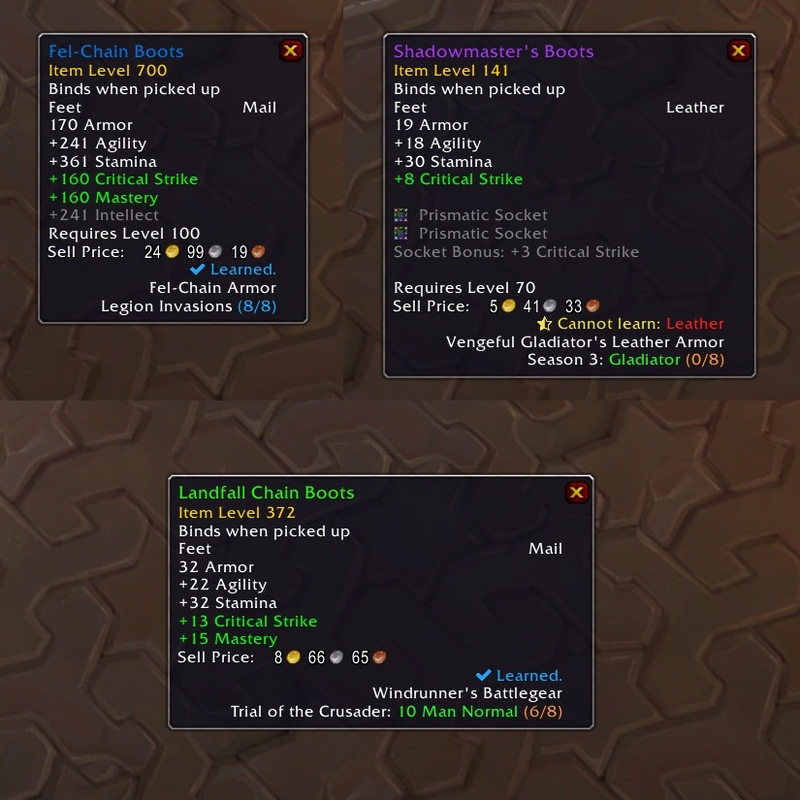 Added tooltips for new Transmog Sets. #70 &; #72 Added set information to the tooltip, along with an option to enable/disable. #55 Updated C_TransmogCollection.ClearSearch to use 7.2 api. #67 Fixed bug with too low level and cannot learn transmog. #67 Adjusted logic to for being too low level to make more sense. #59 Optimizations for checking/updating the database. #31 Fixed icon overlay not updating when bags are opened individually. #48 Fixed bug with weapons returning as equippable incorrectly. Has this continued to happen after you made this comment? It shouldn't have, but if it has please do let me know. Sorry for not seeing your comment until now. Last edited by AmiYuy : 03-26-18 at 06:31 PM. 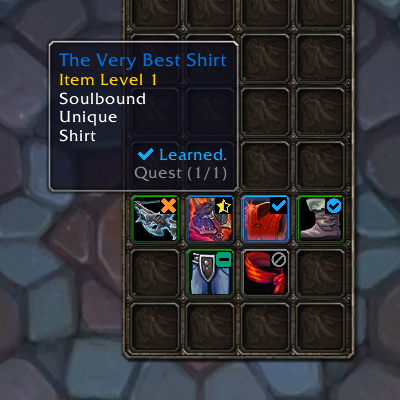 7.3.5 has removed several appearances. A hotfix has restored SOME of them. Is there any log file where I can see exactly what appearances were removed? This was caused by Blizzard's bugs at patch release. We're not sure why our print is not letting go of the negative number, but nothing should actually be being removed. It's on our radar, but it is not anything to worry about right now. 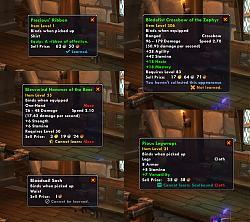 My engineer, a mage, is the only crafting toon on a pair of linked realms. When I look at Shrediron's Shredder in my profession pane, it shows the shaded yellow star. When I hover over the picture to get the full tooltip, it does not give me the checkmark for having learned it, despite the fact that my hunter, on the other linked realm, wore the gun for most of WoD and still has it in the bank. I assume you upgraded that gun, right? 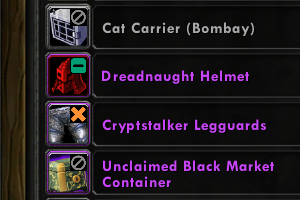 WoD crafted items have 3 different appearances. The one your Mage can craft, the version they see is Stage 1, and you probably upgraded your Hunter's gun to 3+. I *believe* this is the only addon to put shaded yellow stars on items that I cannot learn on the current character, and have NOT learned on any characters. Just letting you know you're leaking a global variable called frame at line 63 of itemOverlay.lua. Thank you! We think we got all of the missing locals this time with version 7.1.0.02, but if you notice any more please do let us know. That is on our to-do list, but is low priority compared to bugs and will take some time. Anyway of re-enabling the tool-tip to read "you have learned this from a different item" again. Please? This is absolutely info I want, and thought I was going to have, here. If I have the appearance, I don't want to equip another item with the appearance, I'd rather sell it. You were able to show it by enabling "Verbose Text". 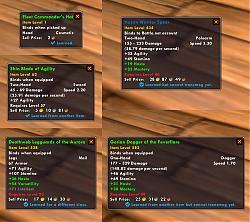 You wouldn't have been equipping those items again though, as it was showing you "Learned" in it's place. Regardless we've made "Learned from another item" show by without having to enable that option with version 7.0.3.20. Ahhhh... sorry, I had no idea that there was an option for changing the verbose text or I wouldn't have bothered you about it. Thanks for the update though, appreciate the hard work. Anyway of re-enabling the tool-tip to read "you have learned this from a different item" again. Not sure if the addon changed, or another transmog addon is messing with the tool-tip for CIMI, but currently if I loot an item, mainly BOEs, CIMI will state that I've already learned it. However, if I equip the same item I will end up learning another version of that particular piece and adding it to my transmog list. Thanks, and keep up the great work.